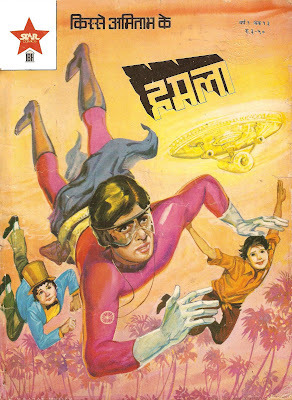 Toofan is a 1989 science fiction fantasy Bollywood movie directed by Ketan Desai and starring Amitabh Bachchan in a double role as twin brothers. One is the title character Toofan, a superhero who uses his crossbrow as a weapon and the other is a magician named Shyam. Ketan Desai’s father Manmohan Desai produced the film. Trending First two weeks were almost 90-100%, Crashed after two weeks. ROI Almost break even, minor losses to some. Recovery ~4 Crore all India distribution share (~5.23 Crore Nett). Relative performance Average compare to biggest Hit of year like Maine Pyaar Kiya and Tridev, Fared better than some other Hits of year like Elan-E-Jung and Chalbaaz and Bhrastachar, mainly due to huge opening. BollyBusiness Note Due to excellent opening, it recovered money for most of distributors. Around 5.25 Crore business was Hit business theatrically at that time, but expectations were to do much more from Amitabh movies. Contrary to popular perception of it being Flop, business wise(ROI) it was average movie. Excellent information, I remember Toofan was heavily hyped and there was long queues outside cinemas for many days, but it was not liked at all .. Audience were expecting another Manmohan desai style entertainer, but this was way below expectations. Perfect analysis yakuza. Yeah, Toofan was disappointment, but commercially it was way better than Jaadugar. During late 80’s Except Jaadugar and Inderjeet .. rest of Amitabh movies which are considered as flops(Toofan, GJS, Akayla, Agneepath),all were in range of 5-7 Crore grosser which was hit business at that time, it was cost and expectations which let them down. Superb analysis. I was always missing your updates, specially this sections. Keep this space alive .. with regular updates. Hi Yakuza new to your blog but sure you know my id Dino from NG and SS. Great analysis above. Why don’t you do this more often. And BTW what abt Ajooba I wana know was it similar to Toofan or was it an outright flop. Hey Dino, how r u ? I have moved to Sydney, and my commitments are not allowing me to do on regular basis. Ajooba was flop. Opening week was nevertheless cent percent, but fall was pretty sharp and earliest. Don’t know why, but Amitabh followed such patterns in most of his career, that he sign similar type of roles/movies at same time, which release in succession and even effect the business of genuine good movie among them.For example, Toofan, Jadugar,Ajooba .. all fantasies with similar role(magician) .. and all released in a row. IMO none of them was that bad, but overdose just killed everyone. Toofan could have been Hit if Jaadugar postponed few weeks. See another case .. Nishabd, Cheeni Kum .. both were similar genre released in succession .. I can bet cheeni Kum would have been bigger grosser, had Nishabd not released earlier. Similarly, Boothnath, Aladin .. both movies for kids released around same time. Sarkar and Family both gangster .. !! Oh I see, I am fine thanks for the info yeah I used to enjoy quite a lot of Toofan and Jaadugar as a child they seemed quite entertaining. Yes overdose of similar movies does kill even the good product. Welcome back Yakuza,we miss u too much,Please continue ur blog and thanks for bringing Amitabh film,Toofan is superb film,I liked it,Hope u will do same of AJOOBA becz everyone like film ajooba but I don’t why it was flop.